I’m not sure how it came to this, but I discovered last week that this turnip and leek blue cheese gratin, in all its weird-looking blue cheese glory, holds up as leftovers for SIX DAYS. So, even if you’re only cooking for one, I highly recommend treating yourself to this indulgent vegetarian dinner. Wednesday: quality time with my baby sis at dinner. Again, great night, excellent wines, and very off-putting brown deviled eggs. Sorry that was not a real meal plan, just in case you had your hopes up. I do promise you Monday’s recipe soon. Basically, the goal of the couple dinners eaten at home was to use up some of the ingredients we had on hand from mother’s day and from me overestimating our calorie needs at the grocery store. By the time I got to the leftover gratin for Thursday’s lunch, hallelujah, it was still every bit as good as when it came out of the oven on the previous Friday night. Except this time, it didn’t burn my tongue. 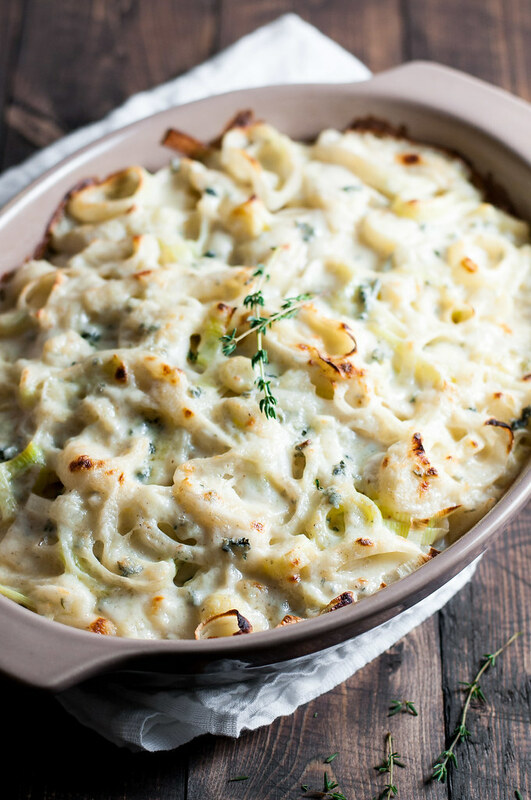 Turnips and leeks tend to be light, silky, and sophisticated as is, but they're even better baked in creamy blue cheese béchamel. 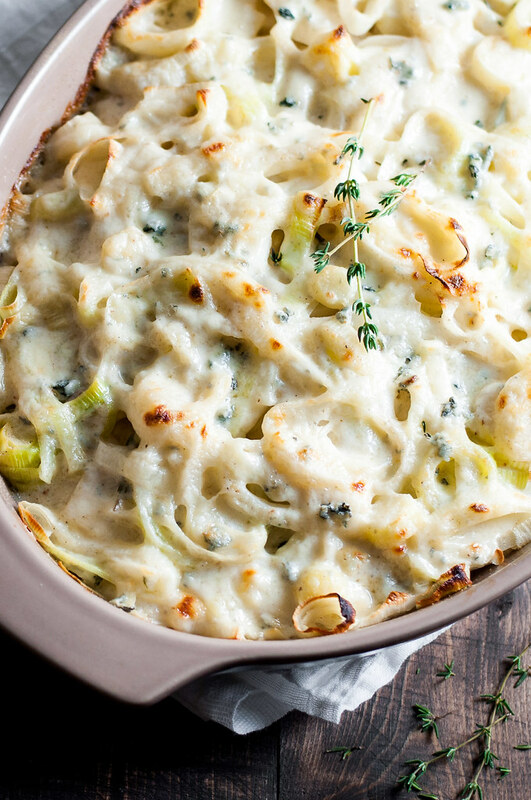 The unique gratin easily serves as a vegetarian main with just a simple green side salad. Gradually heat milk with thyme, peppercorns, garlic, and onion in a small saucepan until just simmering. Turn off heat and strain milk into a liquid measuring cup. In a medium saucepan, melt butter over medium, then add flour and stir 3 to 5 minutes, moving on to the next step if the mixture begins to darken. Reduce heat to medium low and whisk while adding warm milk. Once combined, increase heat gradually until sauce simmers, then maintain a simmer and stir almost constantly until thickened, 5 to 10 minutes. Off heat, whisk in gorgonzola until nearly melted, then stir in cream. Season with a pinch of ground or grated nutmeg and salt and pepper to taste. Cover or otherwise keep warm while assembling the gratin. Preheat oven to 375 (F). Set a medium pot of water over high heat. Meanwhile, rub a 2 qt. 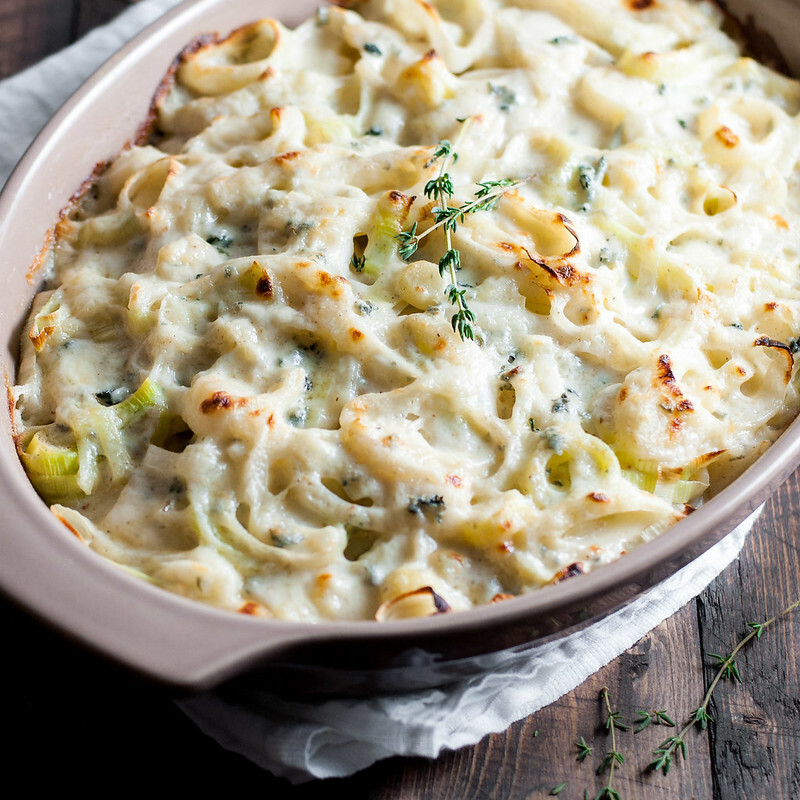 gratin or baking dish with the cut surface of the garlic clove, then grease with butter. When water boils, add a generous pinch of salt, then the leeks. Keep heat on high as the leeks cook for 2 minutes, then remove to a colander set over a dish towel. Place turnips in boiling water and cook 4 minutes, moving leeks to a small bowl in the meantime. Drain turnips in the colander. Make a layer of half the turnips followed by half the leeks and all the thyme sprigs in the prepared dish, then sprinkle with salt and pepper. Layer remaining turnips and leeks over the top, followed by more salt and pepper. Pour béchamel over the vegetables to cover, then gently shake the pan to work sauce down into the vegetable layers. Bake 30 minutes just above the center rack in the oven. If desired, run under the broiler for a couple minutes to achieve golden spots on top. Cool 5 minutes before serving. 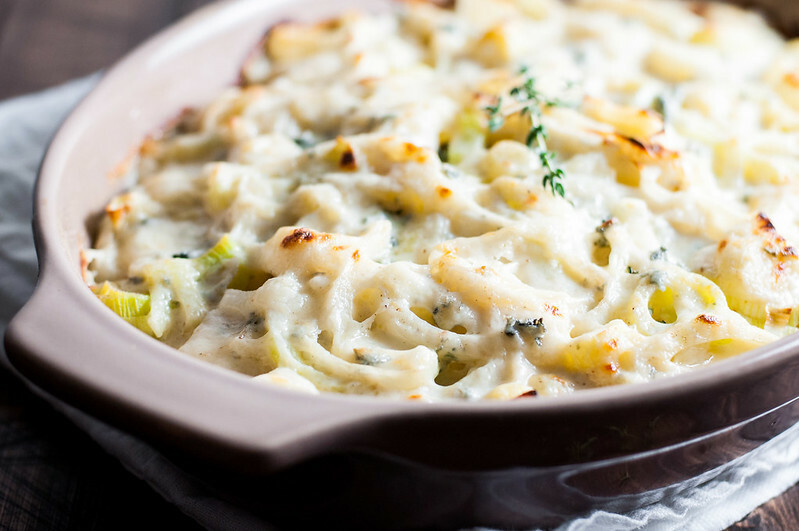 Gratin can be assembled a day ahead without baking, and leftovers keep well in the refrigerator almost a week. Nutrition: vegetarian. To make gluten free, use GF thickener in place of flour in the roux (I haven't tested one) or use warm cream in place of prepared béchamel. Instead of mixing blue cheese into cream, sprinkle it over vegetables, then add the cream. Adapted from Deborah Madison's The New Vegetarian Cooking for Everyone. Note: This page contains affiliate links. It does NOT contain sponsored content. Affiliate links (to products I recommend, on Amazon) offset my ingredient and website maintenance costs, so I can keep bringing you pungent recipes like this one. Thanks! This recipe sounds so rich, balanced and earthy! Where is the blue cheese in this recipe? I made this with the blue cheese as I didn’t have the gorgonzola, but otherwise made as directed, and it was AWESOME! I love the bechamel sauce and all these ingredients really work well together. Will definitely make again! Thank you so much for posting!